A vast city built by the ancient Maya and discovered nearly a century ago is finally starting to yield its secrets. Excavating for the first time in the sprawling complex of Xultún in Guatemalas Petén region, archaeologists have uncovered a structure that contains what appears to be a work space for the towns scribe, its walls adorned with unique paintings  one depicting a lineup of men in black uniforms  and hundreds of scrawled numbers. Many are calculations relating to the Maya calendar. One wall of the structure, thought to be a house, is covered with tiny, millimeter-thick, red and black glyphs unlike any seen before at other Maya sites. Some appear to represent the various calendrical cycles charted by the Maya  the 260-day ceremonial calendar, the 365-day solar calendar, the 584-day cycle of the planet Venus and the 780-day cycle of Mars, reports archaeologist William Saturno of Boston University, who led the exploration and excavation. The discovery is reported in the June issue of National Geographic magazine and in the May 11 issue of the journal Science. The mural represents the first Maya art to be found on the walls of a house. There are tiny glyphs all over the wall, bars and dots representing columns of numbers. Its the kind of thing that only appears in one place  the Dresden Codex, which the Maya wrote many centuries later. Weve never seen anything like it, said David Stuart, Schele Professor of Mesoamerican Art and Writing at the University of Texas-Austin, who deciphered the glyphs. The vegetation-covered structure was first spotted in 2010 by Saturnos student Max Chamberlain, who was following looters trenches to explore the site of Xultún, hidden in the remote rain forest of the Petén. Then, supported by a series of grants from the National Geographic Society, Saturno and his team launched an organized exploration and excavation of the house, working urgently to beat the regions rainy seasons, which threatened to erase what time had so far preserved. Xultún, a 12-square-mile site where tens of thousands once lived, was first discovered about 100 years ago by a Guatemalan worker and roughly mapped in the 1920s by Sylvanus Morley, who named the site Xultún  end stone. Scientists from Harvard University mapped more of the site in the 1970s. The house discovered by Saturnos team was numbered 54 of 56 structures counted and mapped at that time. Thousands at Xultún remain uncounted. The teams excavations reveal that monumental construction at Xultún began in the first centuries B.C. The site thrived until the end of the Classic Maya period; the sites last carved monument dates to around 890 A.D. Xultún stood only about five miles from San Bartolo, where in 2001 Saturno found rare, extensive murals painted on the walls of a ritual structure by the ancient Maya. The north wall lies straight ahead as one enters the room. An off-center niche in the wall features a painting of a seated king, wearing blue feathers. A long rod made of bone mounted on the wall allowed a curtain to be pulled across the kings portrait, hiding it and revealing a well-preserved painting of a man whose image is wrapped around the wall; he is depicted in vibrant orange and holds a pen. Maya glyphs near his face call him Younger Brother Obsidian, a curious title seldom seen in Maya text. Based on other Maya sites, Saturno theorizes he could be the son or younger brother of the king and possibly the artist-scribe who lived in the house. The portrait of the king implies a relationship between whoever lived in this space and the royal family, Saturno said. Four long numbers on the wall representing one-third of a million to 2.5 million days likely bring together all of the astronomical cycles  such as those of Mars, Venus and the lunar eclipses  that the Maya thought important, dates that stretch some 7,000 years into the future. This is the first place Maya archaeologists have found that seems to tabulate all of these cycles in this way. 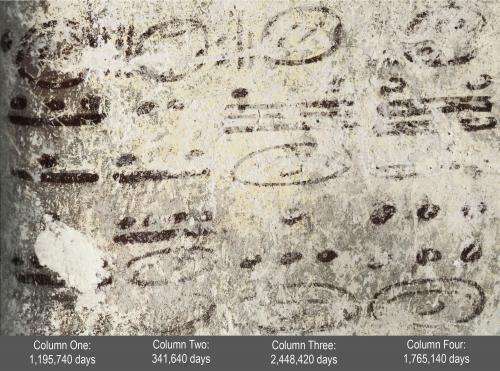 Another number scratched into the plaster surface likely records the date  813 A.D., a time when the Maya world had begun to collapse. The west wall: Three male figures loom on this wall, all of them seated and painted in black, wearing only white loincloths, medallions around their necks and identical single-feathered, miter-style head dresses. We havent seen uniform head dresses like that anywhere before, Saturno said. Its clearly a costume of some kind. One of the figures is particularly burly, like a sumo wrestler, and he is labeled Older Brother Obsidian. Another is labeled as a youth. The east wall: Although badly eroded, another black-painted human figure and remnants of others can be seen. But the wall is dominated by numerical figures, including columns of numbers representing counting and calendrical calculations. Some of the numbers track the phases of the moon; others try to reconcile lunar periods with the solar calendar. Skywatching like this was a tool for predicting eclipses, Saturno said. One well-preserved section contains numerical notes painted in red that appear to be corrections to more formal calculations appearing alongside them. The most exciting point is that we now see that the Maya were making such computations hundreds of years  and in places other than books  before they recorded them in the Codices, Aveni said. More information: "Ancient Maya Astronomical Tables from Xultun, Guatemala," by	W.A. Saturno; F. Rossi	at	Boston University	in	Boston, MA; D. Stuart	at	University of Texas, Austin	in	Austin, TX; A.F. Aveni	at	Colgate University	in	Hamilton, NY. why is this even a topic for conversation? Does my doctor have a relationship with Obama or Colin Powell just because he has a portrait of them on the wall? No. I think this is as exciting as the finding of a lost sketch by Da vinci or a lost Tesla notebook. For the first time, we see how a trained Mayan scholar "thinks". We've found something pretty cool. It will be interesting to see what insights might be drawn from it. Now if they could get it to load properly. Thanks for adding it though, editors. Corection The real Numbers Are!! It's our present day fundamentalist Christian mindset that longs for a biblical apocalypse and falsely reads into another culture's belief system. What's valuable about this piece is it confirms the eternal primitivism of man. Actually, Christians reject the Mayan Calendar 2012 nonsense. I would guess that the majority of Christians today believe in the second coming of Christ and all of the ensuing "science-based" beliefs in the "rapture", "the four horsemen of the Apocalypse",etc. Just like about all the other "prophecies of armageddon/total destruction" its a load of croc just like Y2K and the rest. Unbelievable to see so many people lacking the sense to realize that its fake and just like all the numerous amounts of times through the ages it has been "foretold" it NEVER HAPPENED. Sure people will possibly throw in their examples of the fall of the Persian empire or Rome or even others but they never came to think that it was civilization that fell there and not the fall on man. comment as you may like (i may not be as spot on with my wording but the gist of what i'm saying is there). What amazes me is how they know what the symbols mean. Holy crap there is a send feedback to editors button! But i could not find the link with the pictures. "i could not find the link with the pictures."